Hi friends, I'm thrilled to finally be able to share this space with you! Our sunroom was a messy, unorganized catchall space with no real purpose. Not anymore! Let me know you the changes we made. Affiliate links are included for your convenience; my full disclosure policy can be found here. Thank you to Timberchic for generously providing the wood for this project. Beige walls and clutter ruled the day in this space that sits at the back of our home. It was full of random furniture and decor. Because the space lacked purpose, it was easy for it to become a catchall. This was my mood board for the space. A fresh coat of white paint covered up the last of the pinky-beige walls in our home...woohoo! Now this room ties in with the rest of our home and doesn't look like a forgotten cave! We added coastal white reclaimed wood to the two end walls. The peel and stick panels from Timberchic were so easy to apply and make a HUGE impact in this space! You can read more about the process (and see a video of us applying it) here. While it was time consuming because these were two large walls, it was a very easy project that we finished it one day! I am really loving all the texture in this room! The fun part...adding personality to a room! I kept the decor simple and inexpensive by using (mostly) what I already had. All the major pieces are neutral, and pops of color were added with plants (it is a sunroom after all, and the plants LOVE this space!) and decorative accessories. We purchased a new chair to create a small comfy seating area across from the fireplace. These chairs are from IKEA and they're a smaller size, perfect for tight spaces where you still want the comfort of an armchair. We already had one, but two makes a nice conversation area without taking up too much real estate in this long, narrow room! The pouf is something I found years ago at a thrift store. I recovered it in a yard of buffalo check fabric. I'll share that project soon. I found the black check pillow cases on Amazon, and I was excited to find two black and white check lampshades at HomeGoods! They replaced the shades that I had, and help add a cohesive look to the room. I created a gallery wall on one of the wood walls. No screws were used as I didn't want to make holes in my brand new wood wall. I'll share my tips and tricks for hanging artwork on a reclaimed wood wall soon! I finally got to hang my DIY subway sign filled with all the places we've lived! The previous curtains in this room were beautiful, but the wrong color. Very creamy, they just didn't look right so I replaced them with 3 pairs of these white sheer curtains from IKEA. They are a sturdy fabric but airy and were very affordable at $25 per pair! If you don't have an IKEA near you, you can now purchase these curtains on Amazon! The other side of this double sided fireplace was recently painted to give our living room a brighter look, but I left this side of the fireplace the original red brick. I decorated it with a shutter and a wreath. My buffalo check painted mason jars fit in perfectly in this room! Black and white checks are a classic, timeless pattern. It will be easy to switch out the pillows and decor when I'm ready to give the room a new look! The other piece that was added was this cottage dresser. It got a major makeover recently (watch for a tutorial soon) and I love how it looks in this space. 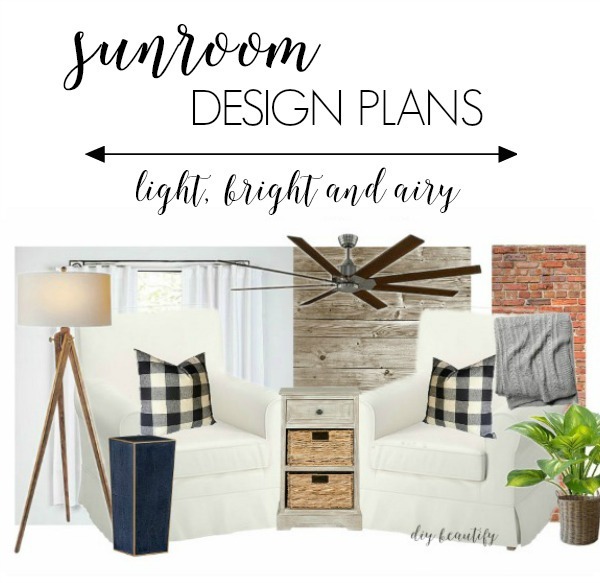 The clutter is gone, our sunroom has a purpose and it has become a favorite spot in our home. I can't wait to decorate our sunroom for Christmas! The light and airy space will be the perfect backdrop for pops of red and green! Be watching...lots of Christmas coming your way very soon! Cindy, this is amazing! I love the way all the black and white pieces came together so perfectly. Thanks Stacy, I am really loving this space!